Data sharing statements and promotion is a strong reality but challenging, especially when considering the many obstacles that remain on several fronts. Among these obstacles is the lack of relevant and recognized rewarding mechanisms for the very specific efforts required to share organized datasets. The prerequisite for data sharing lies in implementing the FAIR principles (Findability, Accessibility, Interoperability, and Reusability) which can add to the workload if done by the researchers themselves; however this aspect is never accounted for when activity is evaluated by funders or reviewers. Individuals with different expertise may contribute at each of these steps (laboratory technicians, resource managers, researchers, legal experts…). Research culture and environment are not perceived as providing sufficient support, nor adequate rewards for researchers who generate and share high-quality datasets. It is vital therefore that funders and research leaders foster an active, on-going dialogue with international partners and work with them to build common incentive structures and effect cultural change. Recognise the contribution of those who generate and share high quality datasets, including as a formal criterion for assessing the track record and achievements of researchers during funding decisions. Form a partnership among funders, research institutions and other stakeholders to establish career paths for data managers. Ensure that the contributions of both early-career researchers and data managers are recognised and valued appropriately, and that the career development of both types of individuals is nurtured. Champion greater recognition of data outputs in the assessment processes to which they contribute. These recommendations have not been promoted so much out of UK whilst they are of great interest at the international level of research governance. Existing initiatives recognise the value of certain steps of the chain towards sharing resources however gaps remain to be filled, especially as regards physical resources. As an example, the BRIF initiative (BRIF: Bioresource Research Impact factor/framework) has already tackled these issues for human biological samples and data. As a result, the CoBRA guideline has been produced and work performed on unique identifiers and relevant parameters towards specific metrics. RDA IGs could build on those previous results and ideas to further identify such gaps and suggest practical solutions to promote resources provision to the community as a valuable genuine activity in research practices. The workflow of the entire process, from resources production to their impact back on the producer has not been explored in RDA groups, to our knowledge. 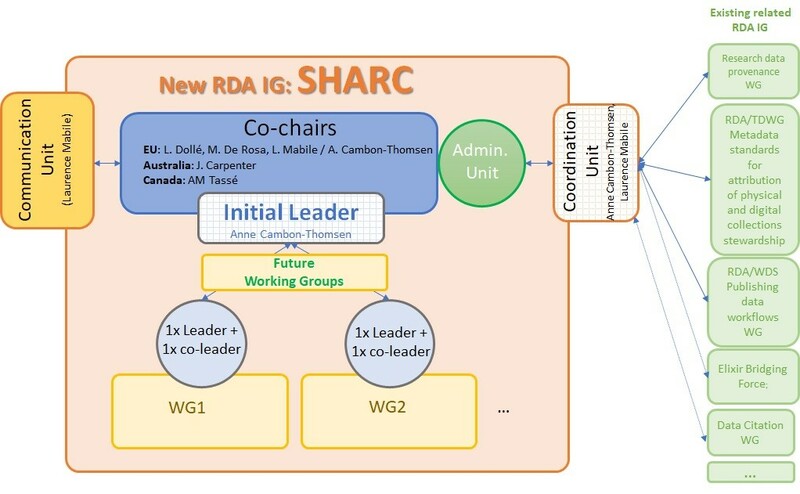 Furthermore, RDA community is focused mainly on data. Extending the work to resources that also have physical samples in addition to data would be a value-added contribution. As part of its mission in keeping within the goal of RDA, the IG will work at finding solutions to foster open sharing of resources. Use case n°1 - The biomedical community: A growing portion of research relies on sample collections and databases. This is especially true in biological and medical sciences with the development of large scale biology in the –omics era. High throughput ‘omics’ platforms require biospecimens, and generate a great amount of data on large numbers of patients and/or healthy individuals. The size and complexity of the collections needed to promote translational research typically extends far beyond the scope of individual research projects and the need to produce these valuable data is being met by contemporary bioresource facilities. While sharing of such resources is essential for optimizing knowledge production, so far only a very small part of them are. A major obstacle lies in the fact that establishing a valuable bioresource requires considerable time and effort. Finding ways to recognize and credit this upstream work is essential. Use case 2 - The Industrial Ecology community: Industrial ecologists rely heavily on data to assess the environmental performances of product during their life cycle. This requires interdisciplinary data from several domains such: as chemistry, ecology, economy, toxicology and climate science, among others. Currently, the availability of harmonized datasets for environmental Life Cycle Assessment (LCA) of products is scarce and the existing proprietary databases are incomplete. Sharing research data on a Research Data Infrastructure is an additional, time-consuming effort for researchers that is not acknowledged. Reward mechanisms for sharing data would significantly improve the transparency of such products’ environmental assessments and the accuracy of environmental models. Moreover, it would also have a high informational value, facilitating responsible consumption and thus, increase the weight of the public opinion’s pressure for significant environmental improvements of activities with high environmental impact. Use case 3 - Data produced by marine and terrestrial biodiversity research projects that evaluate and monitor Good Environmental Status have a high potential of use by stakeholders involved in environmental management. The accessibility of data on the environment, especially in ecology, has never been more problematic, however. The cost of these data and their heritage value is increasingly highlighted, whereas due to budgetary constraints, the resources allocated to their production and their availability are limited. Rewarding data sharing could have a beneficial impact on the whole system. As a case in point, the data produced by biodiversity research are heterogeneous and produced by a multitude of entities, therefore standard formats and protocols would allow the interconnection of databases, and semantic approaches could contribute significantly to their interoperability. However, the specific scientific objectives and the logistics of project management and information gathering lead to a decentralised distribution of data, which can hinder environmental research. Moreover, data are considered as a technical end, and should be more intended as a scientific end, as an object of study: by furthering primary analyses, in the context of a research question for which they have been collected, data can be reused - within the limits allowed by their quality - and their exploration, by appropriate method as graphs, may lead to the formulation of new scientific hypotheses. Actually, the “rising tide of data” requires new approaches to data management and data preservation; access and sharing should be supported in a seamless way. According to the situational analysis of the French landscape of biodiversity research observatories, data planning, collection, quality assurance, description, conservation and analysis are mostly led by observatories, whereas data discovery (of potentially useful data) and data integration from varied sources are poorly done. This case study aims to present the latest trends in data infrastructure and data management solutions for research and to discuss the progress of the Open Science Cloud, tools and initiatives about data sharing rewarding in the field of biodiversity and environmental data. Materials science: catalysts, microscopy data, etc. To review the existing rewarding mechanisms in various communities, as well as their limits and identify factors that could to improve the process and optimize the sharing of bioresources; i.e. data and physical samples (ex: tools, incentives, requirements…). To use this analysis to encourage the inclusion of bioresources sharing-related criteria in the research evaluation process at the European institutional level, (i.e. without making this activity mandatory, increase coherence between evaluation and real practice). To disseminate information and findings to diverse communities of stakeholders. To develop a process for stepwise adoption of principles and implementation measures adapted to national, local and institutional contexts. Anne Cambon-Thomsen is the initial leader. Laurence Mabile will dedicate 30 % of her workload to the coordination of the group itself. Co-chairs will help in interacting with the relevant RDA groups and to coordinate meetings on their continent. The different communities will contribute to the white paper detailing the existing and lacking rewarding mechanisms in the sharing process. Three existing RDA groups have identified themselves during our BoF session at RDA P9, as having common concerns: the ‘Research data provenance working group’, the ‘RDA / TDWG Metadata Standards for attribution of physical and digital collections stewardship’ and the RDA/WDS Publishing Data Workflows WG. Data Citation WG, Elixir Bridging Force IG, Reproducibility IG may have some overlapping interests, too. Those groups will be contacted via the RDA platform, and virtual meetings will be organized to start with. If relevant, cross-sessions will be organized at RDA plenaries. We also plan to alert them about the events organized by our BoF/IG group. Answering to the next European Community public stakeholder consultation related to the preparation of the EU research FP9 and explore the possibility to include such recognition criteria in FP9 as well as in an EU-level strategies that foster implementation at an institutional level (such as what exists for human resources with the HRS4R (Human resource strategy for research)) . Forming RDA working groups to address issues such as whether future working groups will pertain to a specific community (like ecological, biomedical, geospatial…) or resolve around specific stakeholders across communities (editors, funders, governing bodies of research institutions, research evaluation policy makers…) or both. Virtual web meetings will be organized as often as necessary, with a minimum of once a month for a regular update. Face to face meetings will be encouraged at each RDA plenary conference. Regular feedback will be relayed towards all interested RDA groups about relevant meetings and conferences of interest for group members. The submission of a proposal to ESOF (Euroscience Open Forum) for a scientific session has been done under the coordination of Fiona Murphy. The conference will be held in July 2018 in Toulouse, FR. Centre for Science and Technology Studies (CWTS). Faculty of Social and Behavioral Sciences. Leiden University. Fondation pour la Recherche sur la Biodiversité (2016), Etat des lieux et analyse du paysage national des observatoires de recherche sur la biodiversité, une étude de l’infrastructure ECOSCOPE. Série FRB, Expertise et synthèse. Ed. Aurélie Delavaud et Robin Goffaux, 72 pp.